RUSH: Now, Obama. Let’s go to top of the audio sound bites. Remember yesterday, a long dissertation in the first hour about what really is going on with the fiscal cliff, and that the real target here is the Republicans, particularly the Republicans in the House, but the Republican Party writ large, Obama is simply trying to decimate it. He is desperate to get Boehner to sign off on raising taxes on the rich. That’s ball game for Obama. If he can get that, he gets a confession. What Obama wants is a confession, an admission from the Republicans that as it was tax cuts that led to all the problems that we’re having. That’s what he wants. From now ’til the end of time he wants that to be economic and political science history that is taught to every young skull full of mush. The Reagan tax cuts, the Bush tax cuts in 2001, 2003, that’s why you don’t have a house; that’s why you don’t have a job; that’s why your savings are depleted; that’s why we’re in an economic mess, is because the rich haven’t been paying everything they should. It had nothing to do with spending. It has nothing to do with entitlements. It has nothing to do about anything government’s doing. It’s the rich have been given an unfair shake by virtue of being allowed to keep much more than they need, much more than they want, much more than they deserve. And so that is the focus. And here is Obama yesterday in Falls Church, Virginia. He’s still campaigning. He was at the home of a middle class family who responded to his call for #My2k stories about how the end of the Bush tax cuts would affect them. And here’s a portion of what he said. OBAMA: Everybody’s gonna have to share in some sacrifice, but it starts with folks who are in the best position to sacrifice, who are in the best position to do a little bit more, to step up, and that’s what my plan does. So, just to be clear, I’m not gonna sign any package that somehow prevents the top rate from going up for folks at the top 2%. RUSH: Now, again, Boehner has offered $800 billion from these people. That was Obama’s original ask, was $800 billion, before the election. When he won, he doubled down, made it $1.6 trillion, and Boehner, earlier this week, conceded, “Okay, we’ll put some revenue on the table, $800 billion, and we’ll get it by limiting loopholes.” By the way, that’s not good. I mean, there are legitimate, lawful deductions that have been written into the tax code for the express purpose of promoting economic activity. And they are under assault. Every legitimate tax deduction is now called a loophole. Wait a minute, a year ago you said you could get over a trillion dollars doing it. Well, no, a friend of mine told me her daughter can’t listen to me anymore ’cause I sound too threatening. She’s 24 and I make her nervous. So I’m just trying to tell people, I’m not threatening anybody. Anyway, Obama says, “No, no, nope, nope, nope, gotta have the rates go up.” So what he’s saying is he doesn’t care about the money, Boehner just said I’ll give you $800 billion, I’ll eliminate deductions, loopholes. “Nope. I want those rates up.” It isn’t about the money, folks. Whatever you think, as far as Obama’s concerned, isn’t about the money. If the Republicans cave on raising rates on the rich, then they are admitting that that’s the problem, as far as every other voter outside the 2% in this country is concerned. RUSH: Here is Chris Wallace of Fox News Sunday. He was on Fox this morning with Martha MacCallum, who said to him, for all intents and purposes, John Boehner continues to say that he will not raise taxes on the top 2%. He wants the revenue to come in the form of changing deductions and loopholes. The president says exactly the opposite. So one side is gonna have to give. Any bet which side it’s likely to be? WALLACE: …seems pretty clear. And you see more and more conservatives and Republican office holders who are caving on that. In return Boehner is going to demand something in return. That has got to be serious spending cuts and serious entitlement reform. RUSH: He’s not gonna get any of that. What she said, one side’s gonna have to give. There’s no giving or caving. There’s ceding. But here’s the thing. Did you hear Chris Wallace say — and this is, by the way, politically this is correct, but it’s not correct in reality, that the Republicans are blocking a tax cut for 98% of the American people. There is no tax cut that’s on the table, ladies and gentlemen. There is not a tax cut. What we face is the expiration of the current tax rates on December 31st. If they go up, then it’s a tax increase on everybody. That increase, in Washington-speak, has now become a tax cut if nothing changes it. It’s absurd. There is no tax cut anywhere yet. RUSH: Okay, I got a little bit more time to spend on this, the Chris Wallace comment. I mean, everybody in Washington is talking this way, media, Republicans, Democrats. There is no tax cut on the table, and another thing to keep in mind is that only 50% of the people are paying income taxes. Not 98% of the people. You talk about the top 2%, and then everybody else supposedly getting a tax cut. Fifty percent of this country don’t pay income tax. It’s maybe 48 and a percentage point or something, but we’ll round it up. Half the country doesn’t pay income taxes. But I want to talk about this notion that there’s a tax cut out there that the Republicans are opposing. There isn’t, folks. Here’s where we are: 2001, 2003, George W. Bush succeeded in lowering marginal rates for everybody, not just the rich, and the top marginal rate right now is 35.9%. He made a deal, the Republicans made a deal — Boehner, Obama — to raise the debt limit some time ago and as part of that deal they’re gonna have to do it again at the end of the year and they put in what they thought were very punitive results if they didn’t get a deal. The very punitive results are that the Bush tax rates end and that defense spending is cut dramatically. And those two items were included because it was said that neither party would allow either one to happen and so we’re guaranteed to get an agreement down the road. We’re down the road, and we’re nowhere near an agreement because Obama, A, the idea that Republicans can hold out for spending cuts, there aren’t any spending cuts. Obama is proposing spending increases, folks. He wants a new stimulus. He is demanding a stimulus, and he’s demanding more government spending, all of which dwarfs even his pretend spending cuts, and even his pretend spending cuts are ten to 20 years down the road. But why are these people so wrong? Why are they discussing a tax cut that doesn’t exist? Because it gives Obama a political advantage. Remember, we’re dealing with low-information voters. And there are a lot of low-information voters. I mean, there are a lot of people who think they’re informed who don’t understand this. There are no tax cuts. Not one tax cut has been proposed here. “But, Rush, but, Rush, why did they keep talking –” because, it hurts the Republicans. It is said the Republicans are in a bind here because they are opposing a tax cut for the middle class, to defend a tax cut for the rich. That’s not what’s going on. The Republicans are holding out for no tax increase on everybody who pays income taxes. That is the Republican position. They do their best to articulate it. Somehow it doesn’t penetrate through the noise. The way that they arrive by playing with the language and calling this a tax cut is this. On December 31st the current income rates, income tax rates, expire, and they go up to what they were when Bill Clinton and Monica Lewinsky were in the Oval Office. For the top rate, that would be 39.6%, almost 40, as opposed to the 35.9 that it is now. And everybody else that pays taxes, income tax, their rates would go up as well. So what’s on the table, the Republicans are trying — in fact, they’ve already agreed to $800 billion in tax increases by eliminating loopholes. It’s a mistake to even have done that. Loopholes are itemized deductions that are legal and lawful, put in the tax code by Congress, not a bunch of rich lobbyists and lawbreakers and so forth sitting around deciding to corrupt it. They are there as a matter of law. The mortgage interest deduction is now a loophole, for example. So every one of you ducting your mortgage interest in the current parlance, you are exercising a loophole. You are a tax cheat. That’s what the word loophole has come to mean, somebody cheating. Getting away with not paying their fair share. So Obama demanding, at first, $800 billion to a trillion dollars procured this way. Boehner said, “Okay, here it is.” Then Obama, “You know what, I have to change my mind, math doesn’t work, you’re gonna raise the rates.” So when the discussion of raising the rates happens, you get the opportunity to talk about a tax cut. What they want you to believe — and this is how stupid Washington believes you to be — they want you to believe that you are getting a tax cut if your tax rate doesn’t change. The same bunch of people who call a 5% increase in spending a cut because the baseline says it should go up 8%, that is called a cut in Washington. When the expectation that a line item will be increased by 8%, and it’s only increased by five, then Democrats running around talk about Draconian 3% cut in spending, when there hasn’t been a cut. There’s gonna be a five percent increase. Well, by the same token, the same people insulting your intelligence are telling you that you will receive a tax cut if your tax rates stay the same. “Mr. Limbaugh, that absolutely makes no sense whatsoever.” I know, to guys like you, Mr. New Castrati, let me try to explain it to you the way they think. On December 31st, if the Republicans don’t just give up, everybody’s tax rates are going up. People that pay income taxes, about half the country, their tax rates are going up. Tax increase. Okay? Hasn’t happened yet. It’s on the books. Now, if there’s a deal and tax rates stay the same, then it’s magic, they’ve just cut on your taxes, except they haven’t. Your taxes aren’t gonna change if there’s a deal. The rates aren’t going to change. You’re not gonna get a tax cut. The only way you get a tax cut is assuming the rate goes up, and then our wizards of smart and our wonderful guardians and protectors at the last moment will rush in and prevent that increase from taking place and say that they cut our taxes, when all they did was leave them the same. So there is no tax cut. The Republicans have not proposed a tax cut for the rich. What the Republicans are trying to do, God bless them in their inability to explain it, what the Republicans are trying to do is maintain current marginal tax rates so that there will not be further punitive tax rate changes on people who earn a living, be they small business owners, be they employees, be they moderately successful, widely successful, nothing-special successful. They don’t want tax rates to go up on anybody. This is being called holding out for tax cuts for the rich. But, again, and it’s perverting the language to even try to make sense of this, the only way anybody could ever say that there’s a tax cut is if these rates go up. But don’t worry, Obama says, I’m here, I’m proposing a tax cut to do away with this tax increase. I’m proposing a tax cut at this moment that’ll roll back your tax rates to what they were on December 31st, and the country’s supposed to go, “Yay, Obama is saving us!” Sorry if this makes you nervous. Sorry if this sounds threatening. I’m just trying to be explanatory. So if this plays out exactly as I’ve said, what’s gonna happen is nothing. Nothing will effectively change, but you will be made to believe the Republicans allowed your taxes to go up and Obama came along and cut them. And at the end of that, if that’s what happens, your tax rate will be no different then than it is today, but you will be told you just got a tax cut. Today you’re being told your tax cut is being blocked by the Republicans because they also want the rich to get a tax cut. There isn’t a tax cut on the table, and if this goes to the brink there will not be a tax cut next year, either. Oh, it’ll be called that. It’ll be labeled a tax cut for the middle class, authored by Obama, who cares about growing the economy, who cares about people getting a fair shake. And when it’s all over, nobody’s tax rates are gonna change, except the rich, whose tax rates will go up. The top 2%, no matter what happens here, will see their rates go up to 39.6, back to the Clinton years. The odds of that are so strong. If the Republicans hold out on that, then they’re gonna get killed politically, and they don’t know how to stop it. They don’t know how to talk around it. They don’t know how to swat that insect away. They’re going to be accused of denying a tax cut for you, defending the rich. Obama has set this up, it’s exactly what he wants. He wants the Republicans isolated as appearing to be in opposition to 98% of the country and in favor and supporting 2%, who already have enough, who already have more than they need. And if you listen to Bill Clinton, people aren’t even asking for a tax cut. Well, guess what? Nobody is going to get one. I don’t care who you are. I don’t care where you live. I don’t care who you voted for, nobody is getting a tax cut with Obamacare alone. The new rules have just been introduced this week, nobody is getting a tax cut. It isn’t happening. But the low-information voters are being told that there’s a tax cut that’s on the table waiting, it’s the Republicans that are standing in the way. None of it’s true. The Republicans have been lassoed by a series of lies, mischaracterizations, misstatements, and, God bless, they’re trying to hold out for the right thing. They just don’t know how to explain it. And I have done the best I can in the time I’ve got. RUSH: The New York Times just tweeted: “Boehner doesn’t rule out raising tax rates.” So there you go. Boehner’s negotiating with himself, is what’s happening. If that happens, I guarantee you, the whole premise of tax cuts is gonna be blamed for all of this economic mess. It’s gonna be written in history books, any book, anything taught, Saturday morning cartoons: tax cuts, not government spending, not irresponsible entitlements, not the welfare state, none of that, that gets a pass. It will be tax cuts. Obama’s premise that this country’s first 220 years were fraudulent and that he’s now fixing it, he’s now correcting all those founding mistakes, will be etched in stone. Tax cuts lead to economic disaster. Tax cuts lead to economic unfairness. Tax cuts lead to people who shouldn’t be rich becoming rich. Tax cuts lead to people who shouldn’t be rich staying rich. Tax cuts means rich people do not pay their fair share. That will become economics 101. Tax cuts is what caused the fall of the United States from superpower status. So for 25 years, a generation, tax cuts are evil. Low-information voters, they’re rounding third base on this premise. Almost home. Just need Boehner to go along with raising the rates, and that’s it. 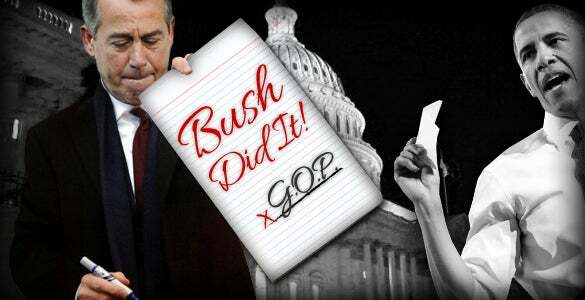 Republican Party’s finished. Their number one identifier’s gone, party of low taxes and economic growth. Nope, party of tax cuts and economic disaster. That’s what they will become. Media and Obama will see to it. RUSH: Boehner was asked about a top rate increase, a top tax rate increase that would be short of 39.6%, and he said, “Well, there are a lot of things possible to come from revenue, if the president seizes the opportunity.” The rumor being that Boehner might settle for 37%. Anything less than 39.6 might be acceptable.